1. In a slow cooker, combine split peas, onion, carrots, celery, thyme, ham, 7 cups water, 1 tsp. salt and 1/2 tsp. pepper. Cover and cook on low until peas are tender, 5 to 5 1/2 hours. 2. Working in batches, finely chop kale in a food processor (you should have about 5 cups). Uncover soup; remove and discard thyme sprigs. Stir in vinegar, then kale. Taste and season with more vinegar, salt and pepper, if desired. Today’s busy lifestyle schedules might leave you with a dull face that lacks lustre. 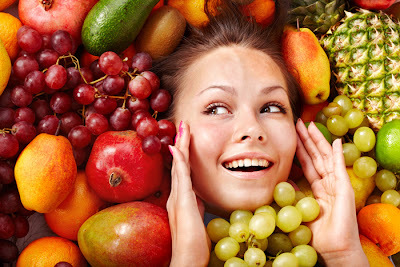 In such a condition, diet plays a very important role as there are no short cuts to attain a healthy and glowing skin naturally. Will seeing red help you lose weight? Previously, scientists found diners at a pasta buffet heaped the marinara on if they used white plates, but took smaller helpings if their plates were red. They did the opposite when the pasta had a white sauce. 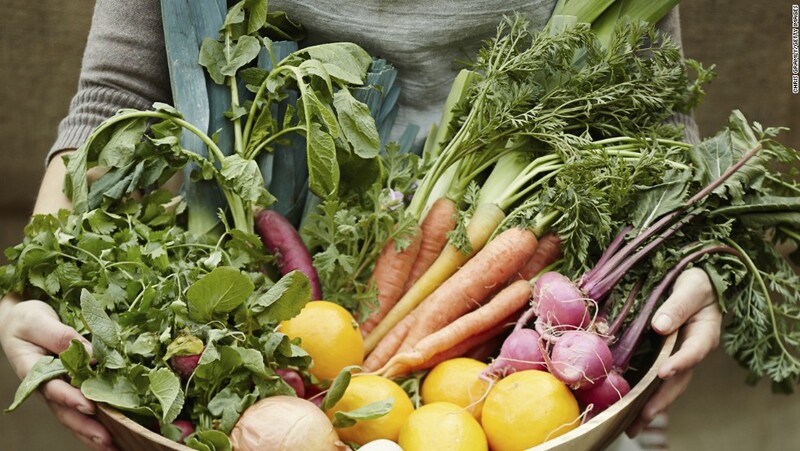 So researchers thought the key to eating less might be sharp color contrasts. But the new study, published in the journal Appetite this month, indicates it’s not contrast, but one specific color — red — that causes people to cut back on what they consume. The research tested how much food or hand cream people used when the product was placed on a red, white or blue plate. “We wanted to find out if the effect was limited to eating or generalized to other types of consumption. The cream was a convenient way to evaluate another sensory system — touch, rather than taste,” said study author Nicola Bruno, cognitive psychology researcher at the University of Parma, Italy. In the new study, volunteers rated the saltiness of popcorn, nuttiness of chocolate and stickiness of hand cream. Each person received a pre-measured sample of a product on a plate that was one of three colors — red, white or blue. The volunteers munched and moisturized as much as they liked while they filled out their answers. Of the 240 participants, 90 taste-tested popcorn, and 75 each sampled the chocolate chips and hand cream. Each survey also included a question to check how much testers liked the product, since this may have triggered them to eat or use more. After the experiments, researchers measured how much the testers had consumed. The authors also measured differences in the color intensity and contrasts of foods, cream and plates. Data in hand, they tested whether differences in people’s consumption correlated with differences in color contrast. On average, people ate less popcorn and chocolate when they were served on red plates compared to blue or white plates. Not surprisingly, self-reported popcorn fans ate more than those who expressed no preference for it on the survey. However, these people consumed more kernels independent of plate color. When researchers corrected for people’s preferences in their statistical analysis, eating off red plates was still associated with lower consumption. Use of the moisturizing cream followed a similar trend. When testing hand cream on red plates, people used about half as much, on average, compared to cream on blue or white plates. Contrast had little to do with these results, said Bruno. Though dark chocolate on a red plate offered less contrast than pale colored popcorn or cream, people still took fewer chocolate chips. “I expected to find the results related to differences in color intensity, but they did not. It’s really related to the color red compared to the food and cream colors,” he said. The study supports the idea that the color red reduces consumption, according to Oliver Genschow, who studies consumer psychology at the University of Mannheim. But don’t run out and buy those red plates as a holiday gift just yet. In all the research so far, participants were unaware of the real reason for the tests, implying an unconscious process may be at work. “We don’t know what will happen if people are conscious of their plate’s color. Maybe it won’t work anymore,” Genschow said. 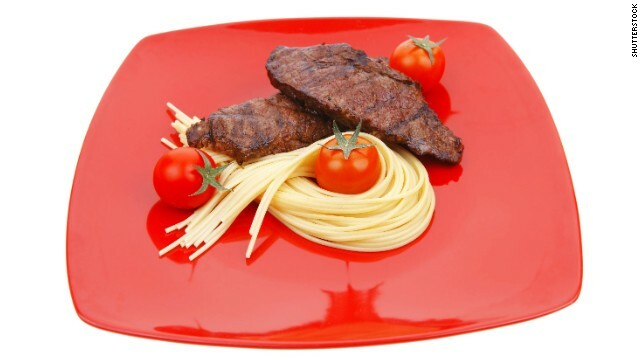 He says color may be an additional factor to consider when treating patients with certain eating disorders, but it’s premature to suggest everyone trying to lose weight should simply switch to red plates. In the quest to lose weight, is cutting out sugar or cutting out fat the solution? To find the answer, 35-year-old identical twins Chris and Xand van Tulleken, who are both doctors, conducted a month-long experiment. While Chris, a physician at University College Hospital, London went on a low-fat, high-carb regime, Xand, director of the Institute of Humanitarian Affairs at Fordham University in New York, chose a high-fat, low-carb diet. The brothers both lost weight. Xand lost the most– nine pounds in one month. In conclusion, the brothers found that eliminating a single macro-nutrient like fat or sugar is not a solution to weight loss, nor are fad diets. “It is about building an environment in your life where you could easily eat a cheap and healthy diet and get enough exercise. It is amazing that we are not all fat and I come away with a sense that I know enough about diet and nutrition and I should be reducing the calories and building an environment where I can do that rather than looking for one toxic ingredient,” Chris said. After the experiment ended, the British twins also concluded that the real villains when it comes to weight gain are processed foods that contained a combination of high fat and high sugar. Susan Jebb, professor of diet and population health at the University of Oxford, agreed with their conclusion. The brothers’ experiment will be featured in the UK on BBC Two’s Horizon program tonight. 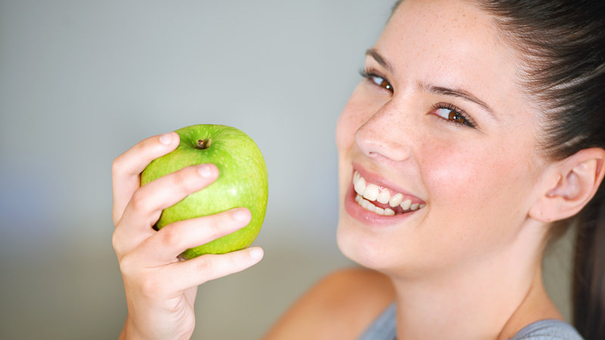 Chewing these lightly abrasive, hard foods rubs plaque and stains off the surface of teeth, says Dr. Matthew Messina, a spokesperson for the American Dental Association. Pop a few almonds for a mid-afternoon snack—they’re full of protein, healthy fats, and the crunch you need to get pearly whites. Although they may not be the ideal pre-date snack, the notoriously bad-for-breath alliums could be beneficial to teeth. Because they’re colorless, they won’t cause surface stains, says Messina, adding that after eating them you’re more likely to brush—which is a surefire way to get whiter teeth. Take a toothpaste break and try brushing with this common ingredient. Baking soda is a base, like bleach, notes Messina, and the “soda”—which is actually a form of salt—in this pantry staple is a mild abrasive that works to scrub off plaque and surface stains. Hard cheese, like the little blocks you get on those delicious appetizer trays, is full of calcium, which strengthens teeth and gums, explains Smigel. Plus, most cheeses are near colorless, meaning they won’t stain your teeth. So go ahead, order that cheese plate. This bright fruit contains citrus, an acid that can wear away tooth enamel if ingested in large doses, making teeth whiter—but at a cost, says Messina. So while we don’t recommend gulping down bags of oranges in the spirit of a bright smile, a juicy helping once in a while is good for your pearly whites, and thanks to loads of vitamin C, your overall health too. Impulsive people are more likely to be binge eaters, warns a new study. Researchers have found the same kinds of impulsive behaviour that lead some people to abuse alcohol and other drugs may also be an important contributor to an unhealthy relationship with food. They discovered that people with impulsive personalities were more likely to report higher levels of food addiction – a compulsive pattern of eating that is similar to drug addiction – and this in turn was associated with obesity. Principla investigator Doctor James MacKillop, associate professor of psychology at the University of Georgia in the US, said: “The notion of food addiction is a very new one, and one that has generated a lot of interest. Dr MacKillop and his colleagues hope that their research will ultimately help physicians and other experts plan treatments and interventions for obese people who have developed an addiction to food, paving the way for a healthier lifestyle. The study, published in the journal Appetite, used two different scales, the Yale Food Addiction Scale and the UPPS-P Impulsive Behavior Scale, to determine levels of food addiction and impulsivity among the 233 participants. Researchers then compared these results with each participant’s body mass index, which is used to determine obesity. However, he said just because someone exhibits impulsive behaviour does not mean they will become obese, but an increase in certain impulsive behaviours is linked to food addiction, which appeared to be the driving force behind higher body mass index (BMI). The results are among the first forays into the study of addictive eating habits and how they contribute to obesity. Dr MacKillop’s team now plans to expand their research by analysing the brain activity of people as they make decisions about food. He said the food industry has created a wide array of eating options, and foods that are high in fat, sodium, sugar and other additives and appear to produce cravings much like illicit drugs. Now his team will work to see how those intense cravings might play a role in the development of obesity. He added: “Modern neuroscience has helped us understand how substances like drugs and alcohol co-opt areas of the brain that evolved to release dopamine and create a sense of happiness or satisfaction. Egg whites are rich in branched-chain amino acids, which keep your metabolism stoked, says Chicago nutritionist David Grotto. Eggs are also loaded with protein and vitamin D.
If you’re even mildly dehydrated, your metabolism may slow down, says Dr. Scott Isaacs, clinical instructor of medicine at the Emory University School of Medicine. Tip: Drink water cold, which forces your body to use more calories to warm it up. Chili peppers contain capsaicin, a chemical compound that can kick metabolism into higher gear, Isaacs says. He suggests adding a tablespoon of chopped chili peppers to a meal once a day. Chili peppers are also an unexpected source of vitamin C.
A study published in Physiology & Behavior found that the average metabolic rate of people who drank caffeinated coffee was 16% higher than that of those who drank decaf. Studies conducted by Michael Zemel, former director of The Nutrition Institute at the University of Tennessee, suggest that consuming calcium may help your body metabolize fat more efficiently. Whole grains help your body burn more fat because they take extra effort to break down than processed grains, like white bread and pasta. Whole foods that are rich in fiber, like brown rice and oatmeal are your best bets. About 20% of women are iron deficient, which is bad news for your waistline — your body can’t work as efficiently to burn calories when it’s missing what it needs to work properly. 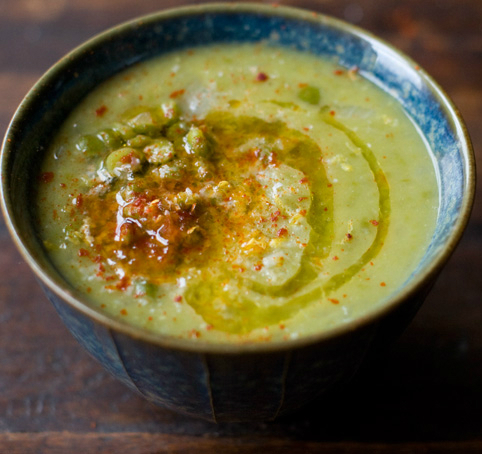 One cup of lentils provides 35% of your daily iron needs. 1. Trim excess fat from the chicken. Place the chicken and enough water to cover in a medium saucepan over high heat until water just begins to bubble. Reduce heat, cover, and poach 10 minutes or until just cooked. Transfer the chicken to a bowl and let cool. 2. While chicken cooks, combine yogurt, mayonnaise, lemon juice, chutney, curry powder, and ginger in a large bowl. 3. Chop chicken and add to yogurt mixture. Add celery, grapes, salt, and pepper. Toss to coat evenly. 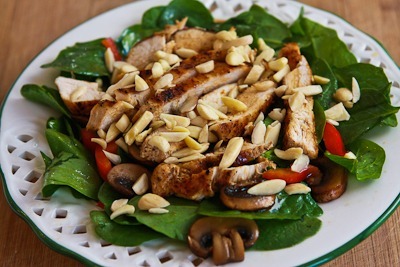 Divide spinach among 4 plates; top with chicken salad and pecans.